Help! Is this a pipevine swallowtail? 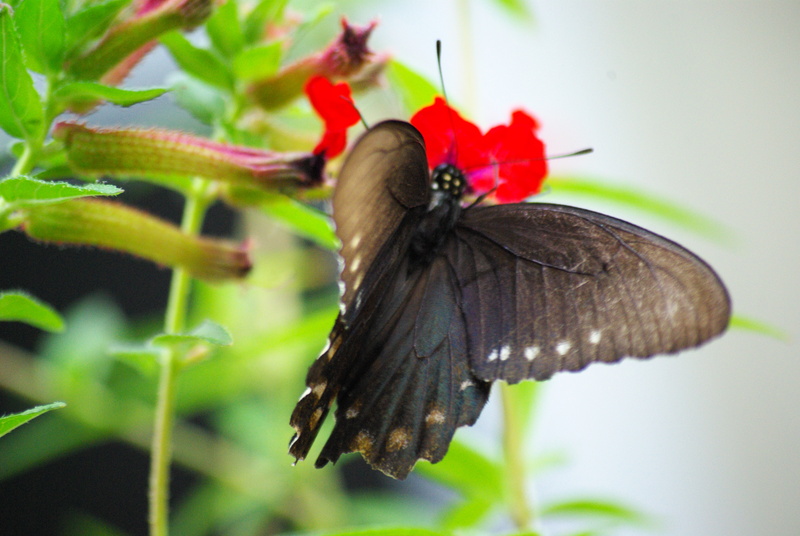 Is this a pipevine swallowtail? This one is tapping the bat-faced cuphea; the pipevine under the holly is undisturbed. A parade of butterflies this year! A lot of monarchs, in contrast to the past three years; we’ve had some Gulf fritillaries, and various sulfurs. The penta seems to be a major stopping point for hairstreaks and other small butterflies. We’ve had a few tiger swallowtails. And this one pictured above. it seems to have the spots of a pipevine swallowtail, but there are no swallowtails! Did they wear off in migrating? Pipevine swallowtail (?) from the underside, still on the cuphea. Can we erase the question mark? Sunlight emphasizes the blue on the underwing. Photos copyright by Ed Darrell, Creative Commons. Please use, with attribution. Rose ‘Eutin’ (1940) is putting on a huge show out front. That big cluster on the right is over 50 flowers on 2 branches. I think the recent rains revved it up. 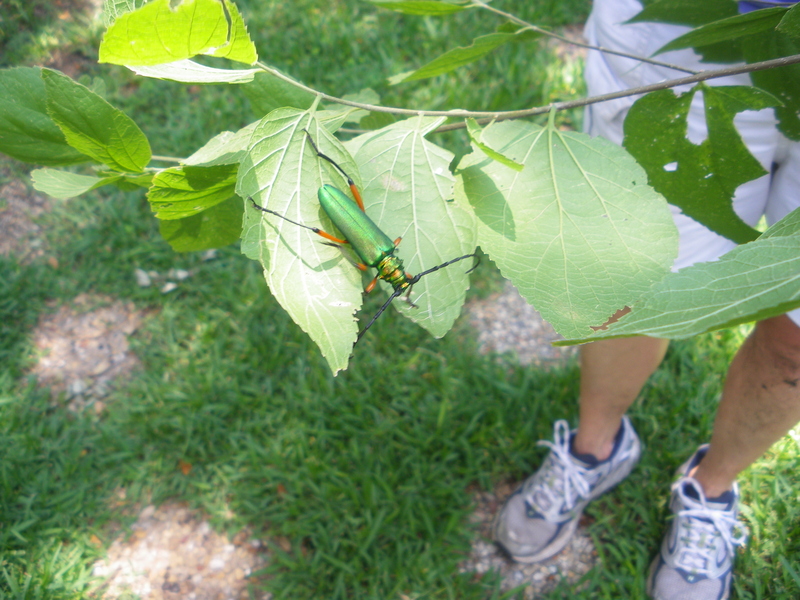 Not an emerald ash borer — but what is it? Emerald green beetle, looks a lot like a longhorn. I feared it to be a dreaded emerald ash borer, but it’s not. Okay. What is it? Any body know? What is this one? 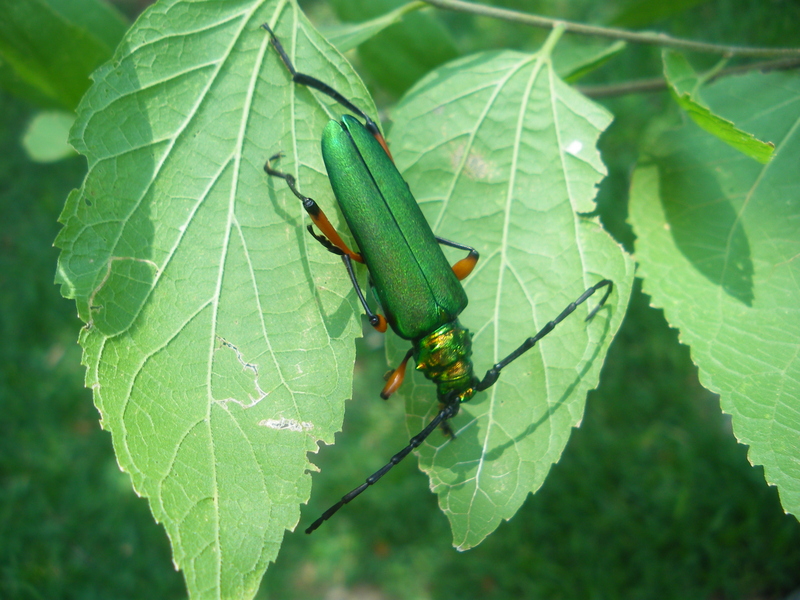 Looks like a longhorn beetle, emerald green. Not an emerald ash borer. Anyone know? It’s too big to be an emerald ash borer. Our mystery beetle is too big to be an emerald ash borer. Brilliant orange underside. 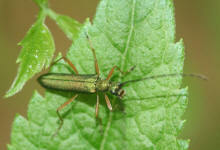 Perhaps a flower longhorn beetle? Where’s Bug Girl when we need her? (Moving?) Roused Bear? Beetles in the Bush? It’s spring. The grasses are sprouting. 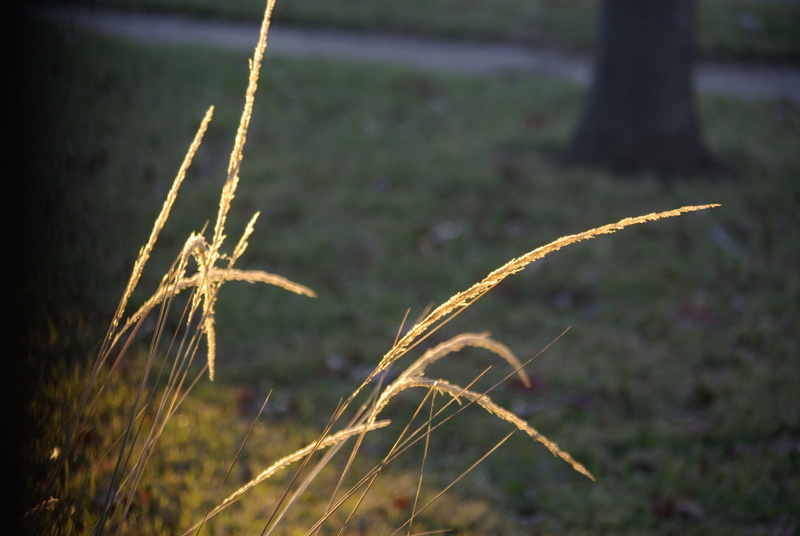 Texas is a good place for grasses. Spring sunlight is spectacular on the new flowers; winter sunlight, in the afternoon, shows a different kind of spectacular. Lindheimer’s muhly grass, Muhlenbergia lindheimeri, shows beauty from soon after it sprouts until long after it’s gone dormant. A garden is a year-around project, and joy. History lives in those grasses, too. You can find some at the Native Plant Society of Texas’s website, and its description of Lindheimer’s muhly. This seems pretty dumb now, but many years ago when I first heard about so many grasses called “muley,” I was puzzled about that name. I’d heard of muley cattle such as polled Herefords, but not hornless grass! Needless to say, as soon as I looked up Lindheimer muhly, I could see it is in a genus named after a Mr. Muhlenberg. Gotthilf Hunrich Ernst Muhlenberg lived from 1753 to 1815. He was born into a prominent Pennsylvania family, and his father and brothers were influential patriots during the Revolutionary War. Because of his family’s involvement in the Revolution, Muhlenberg was on the British hit list. While he was hiding out in a rural area away from Philadelphia during the Revolution, Muhlenberg became interested in botany. Through his extensive collections, Muhlenberg made major contributions to botany, and many plants have been named in his honor. For example, among our local flora are several species of muhly grass (Muhlenbergia) and Chinquapin oak (Quercus muhlenbergii). Lindheimer muhly was named in honor of Ferdinand Lindheimer, the “Father of Texas Botany.” Many other plants native to the Texas Hill Country also bear the name “Lindheimer” or “Lindheimer’s.” Most of these plants were first collected by Lindheimer, who settled on the banks of the Comal River in New Braunfels in 1845. Another entry in the Blackland Prairie Almanac, perhaps. No, he’s not particularly gold — but this is winter, and if he’s going to get his breeding plumage, it will come in a couple of weeks. 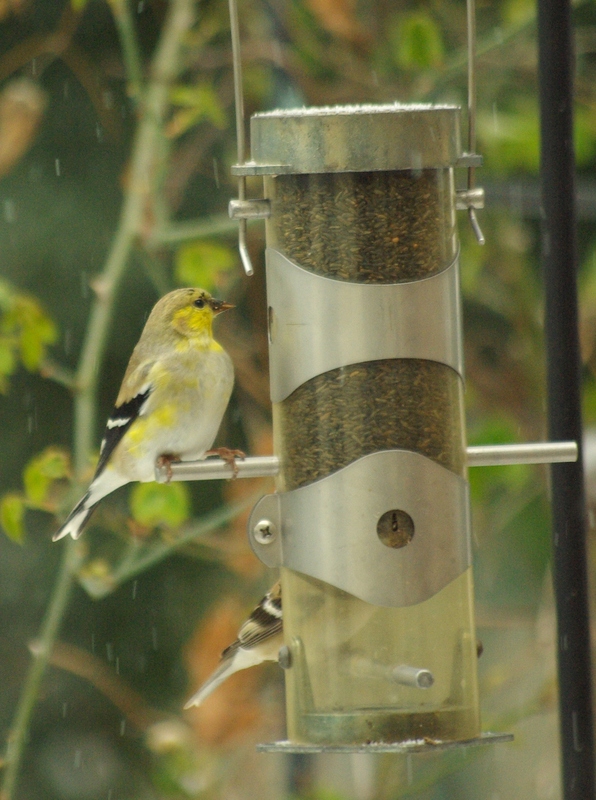 We’ve had Niger thistle seed feeders out for years; this year one goldfinch (Spinus tristis) finally started to visit. We’ve had as many as four at a time — but they’re probably headed north soon. Here’s a shot of our first guest, from a couple of weeks ago. 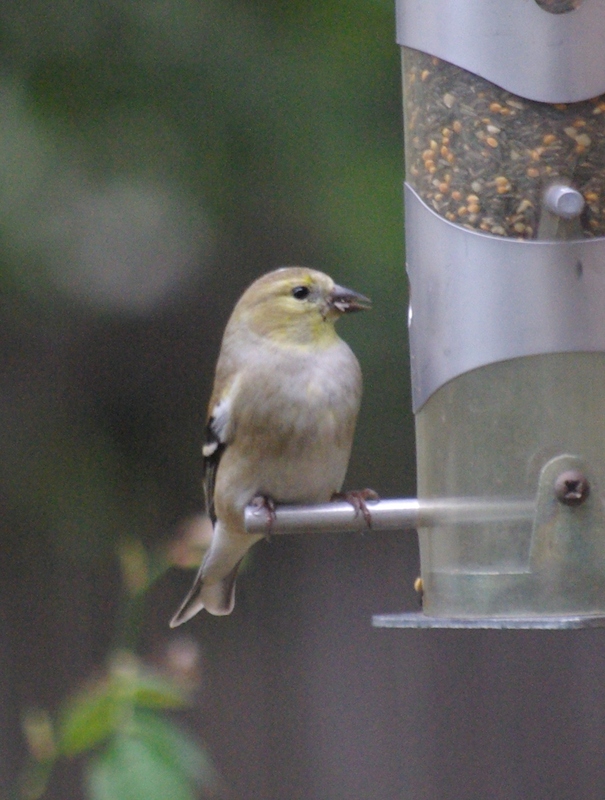 A goldfinch male, checking out the feeder before bringing in his buddies — we hope. 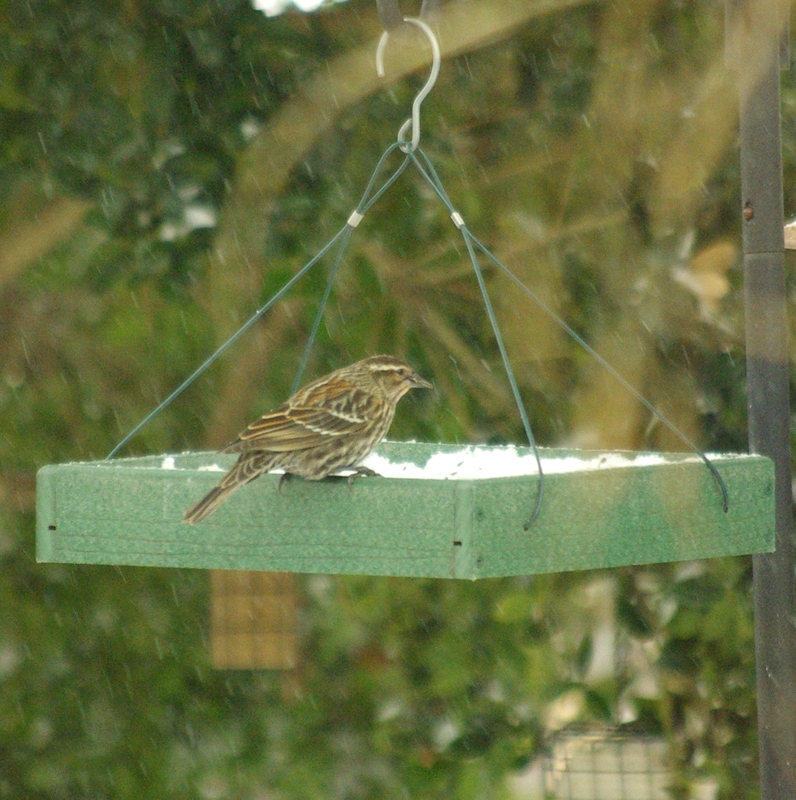 If you’re north of Dallas, and you see this guy at your feeder this summer, tell him “hello” from us. 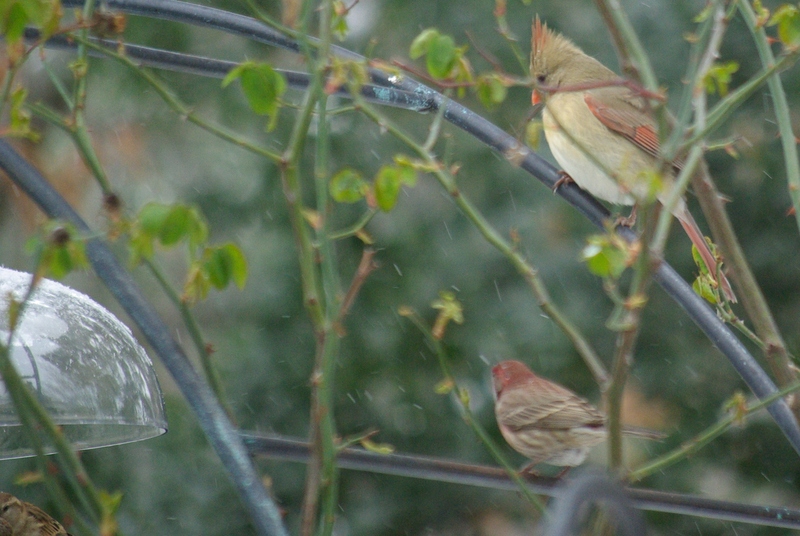 The non-breeding plumage isn’t so flashy as the bright yellow of the breeding males. 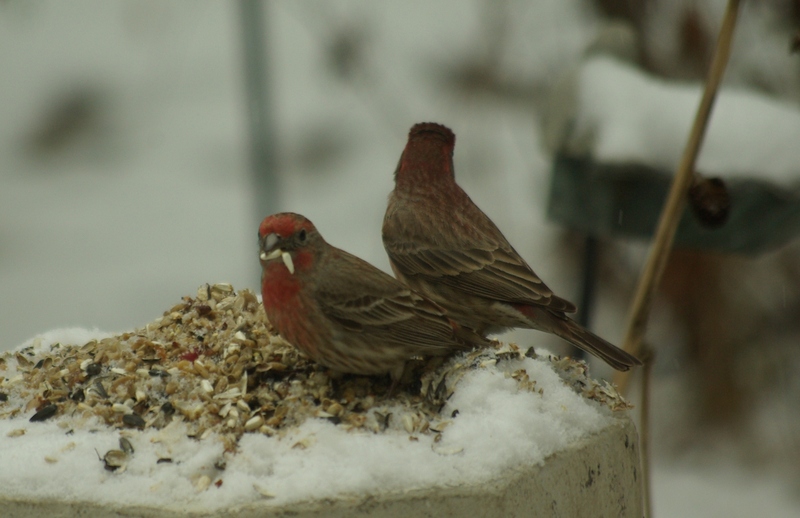 Some of the finches settle in to a beautiful, smooth olive-drab livery for much of the winter. Close up, they look like good pen-ink-drawings by a master artist. The white dove was a short-lived interlude; the white-winged doves seem to be with us constantly. One family in 2011; two families in 2012 — and our yard isn’t that big. 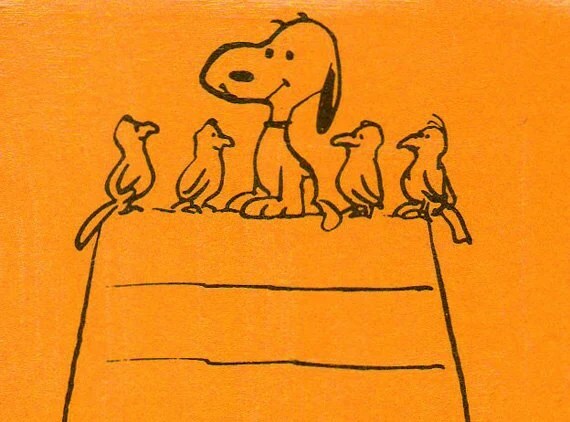 A very early version of the birds who visited, befriended, and plagued Snoopy — this drawing, while faithful to Shultz’s work, was done by another artist. At least they didn’t drink our beer and try to make off with the Picasso. 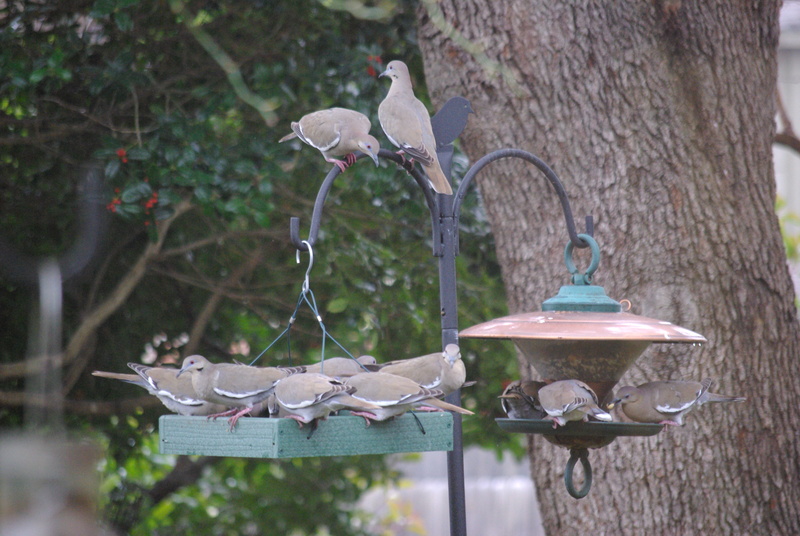 White-winged doves are really too big for any of our feeders — but what are you going to tell a rampaging herd of them? Photos by Ed Darrell – use encouraged with attribution. 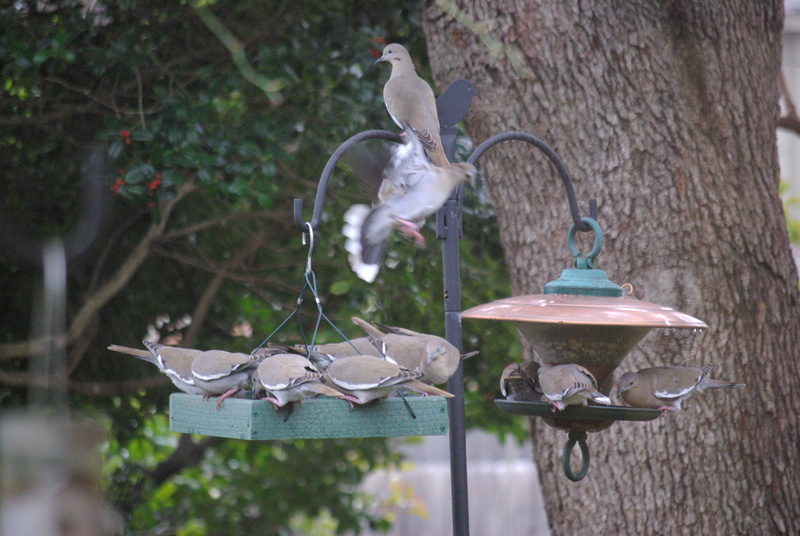 Enough doves to frighten Alfred Hitchcock — Two of these birds is too many for either side of this feeding station. How many do you see here? 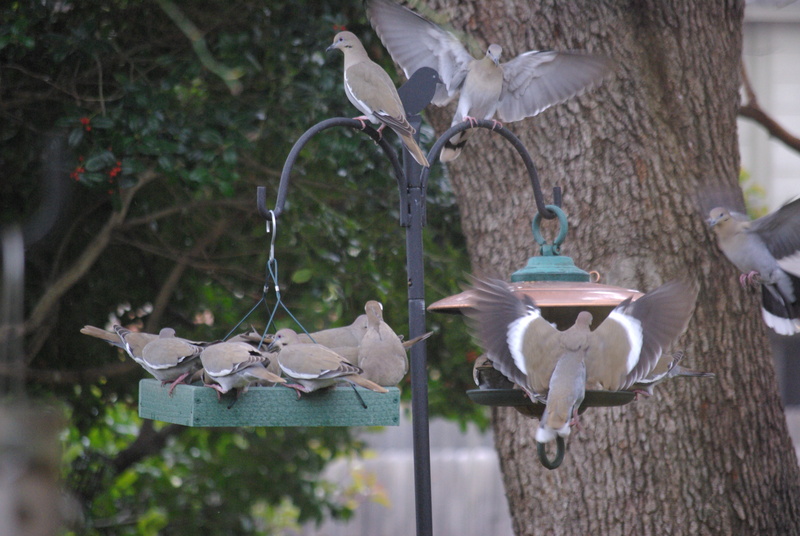 Not enough room for all, and so they jostle and push each other off the feeders. See the display of the white stripe on the wings of one of our subjects here, from which the species gets its name. Blue jays enforce the “too-long-or-too-many-at-the-feeder” rules here, but they can be distracted by peanuts put out by neighbors. In any case, they were absent when we needed them.